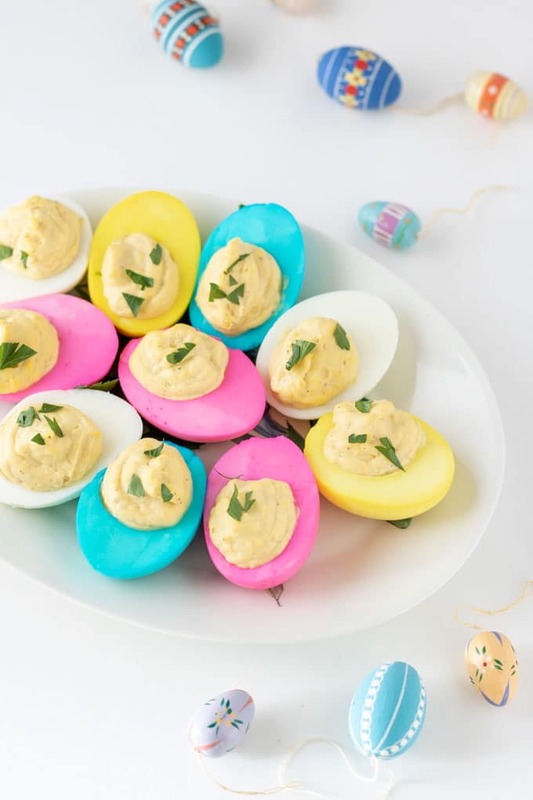 These Easter Deviled Eggs are a fun twist on traditional appetizers and a kid favorite! Colorful & delicious, they will brighten brighten your Easter feast! It is a right of passage growing up that you will enjoy dyeing Easter Eggs with your Mom! At least it is in the United States! By the end of the dyeing session, of course, Mom has dye everywhere! And the kids’ fingers are dyed multi colored until a nice long bath can soak it off! This is an easy project to get the kids involved in! You can get creative and dye the eggs different colors, or just crack the egg shells all the way around. Then dye the egg with the shell still on, to get a crackle effect on your eggs. There are folks who would tell you to buy fresh eggs, because they peel easier. Having owned chickens for many, many years, I can tell you there is nothing further from the truth! Fresh eggs do not peel well. The reason for this is that the albumen, or egg white adheres to the shell when eggs are fresh. Here is a great article to explain a bit about it from PopSugar. So this is one case where you do not want to search the expiration date on the package and find the newest eggs. My best advice is to purchase your eggs 10-14 days before making hard bolied eggs. Place cold eggs in saucepan and cover with cold water. Bring to boil over medium heat, uncovered. Once they boil, immediately remove the pot from heat and cover the pan. Place egg pan in sink and fill with cold water, until the water and the pan remain cold. Crack eggs and peel under running water, to help the membrane separate from the white. You only need 4 ingredients to make these delicious deviled eggs. They can be made a day ahead of time, but the presentation is better if made the same day. You can hard boil the eggs and peel them a couple days before. Store in tupperware container with lid so that the smell doesn’t contaminate your refrigerator. Cut eggs in half lengthwise. Remove yolks into bowl. Mix Easter egg colors according to package directions. Place egg white in colors. Mash yolks with fork. Add mayonnaise, dry mustard and pepper. Dye eggs to desired shade and remove to wire rack to dry. Flip eggs over to thoroughly dry inside. When eggs are totally dry, pipe filling into each egg white. Garnish with paprika, pepper and parsley, if desired. The short answer is NO, you can’t freeze deviled eggs! The texture and appearance of the deviled eggs will suffer dramatically. The egg white will get hard and taste pasty. 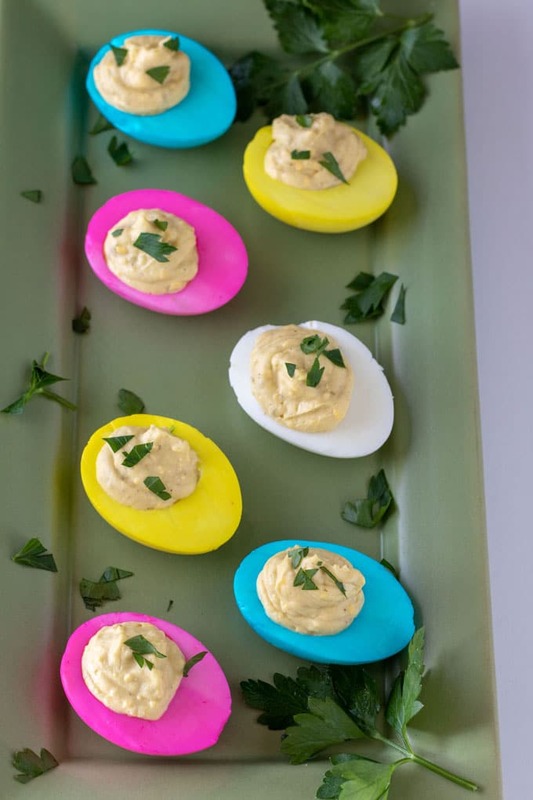 Now won’t these colorful Easter Deviled Eggs brighten up your table? Whether you are serving brunch, or serving them as an appetizer with dinner, these will be a family favorite! 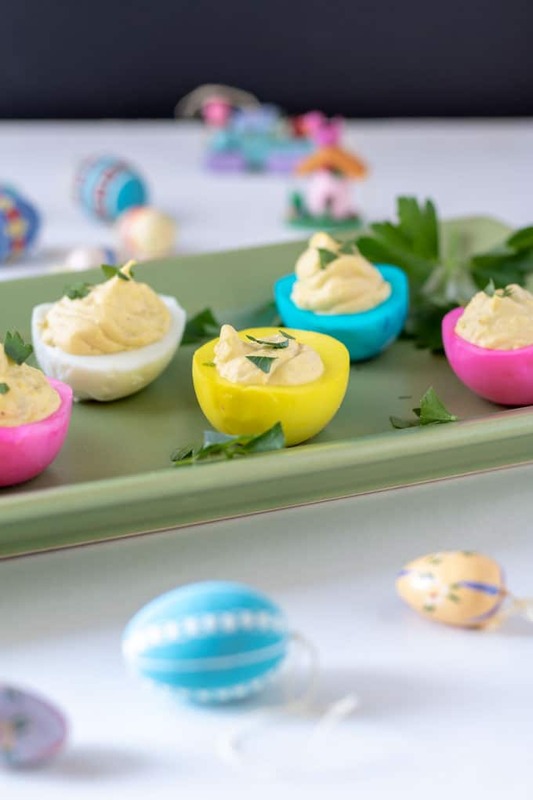 That is how easy it is to make your own Easter Deviled Eggs at home! A fun and tasty family project! That’s how easy it is to make Easter Deviled Eggs. Thanks for stopping by today! 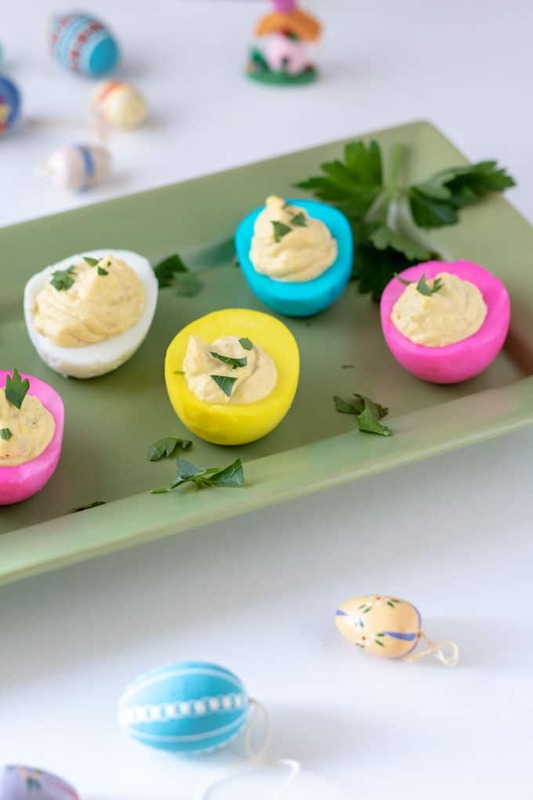 These Easter Deviled Eggs are fun twist on traditional appetizers and a kid favorite! Colorful & delicious, they will brighten brighten your Easter feast! 12 eggs See post for buying tips! Hard boil eggs. See How to Hard Boil Perfect Eggs, Every Time section in post. Mix food safe coloring according to package directions. Cut eggs in half lengthwise. Remove yolks to bowl. Dip egg white in coloring until desired shade is reached. Place on wire rack and dry egg whites completely, inside cavity and out. Mash egg yolks with fork. Mix mayonnaise, dry mustard and pepper with egg yolks until smooth. These are so cute! My kids will have fun dyeing these eggs! I might even get creative and try my own tie dyed version! Oh my gosh, these are so fun! The colors are so vibrant and add a pop of color to the table! Thank you Jen! They look really pretty on the table! 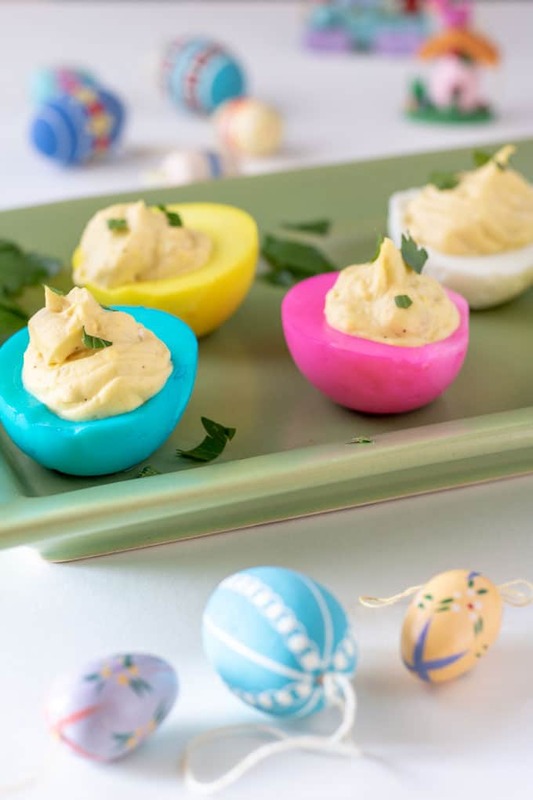 I’m on a serious deviled egg kick right now, and these are so cute and perfect for Easter! I’ve never dyed the actual whites, though. That makes these so festive. Yes, they really brighten up my table! Thanks Lauren! Those are so much fun and I bet delicious too! I love the bright colors of Easter! Thank you Pam! I appreciate you stopping by! I think they might! Thank you for stopping by Neli! Thank you Sue! You can leave the egg whites in the dye as long as you want. If you’d like them more pastel, only leave them in a minute! I love this idea! Such vibrant colors, will definitely be trying these soon! Thank you Kristina! I hope you enjoy it! Thank you Chef! I appreciate you stopping by! Oh wow, I’ve never came across a fancy recipe like this, I love it! 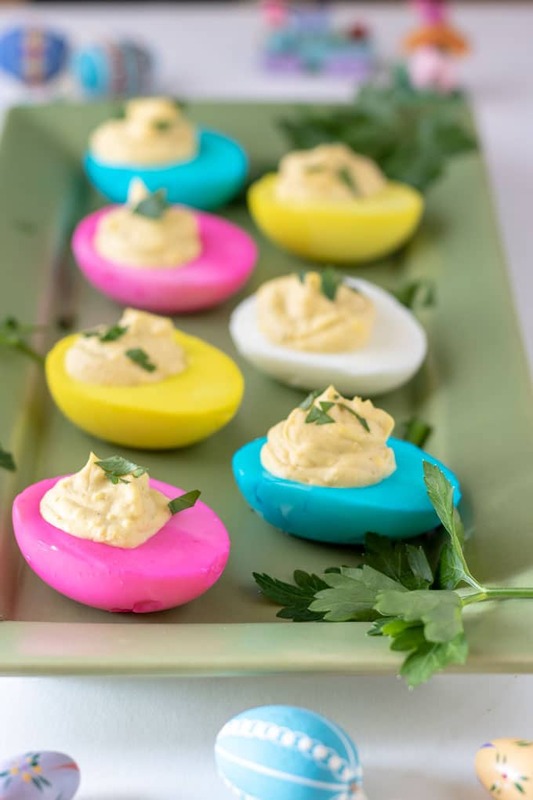 Such a colorful, fancy, Easter appetizer! Wow. 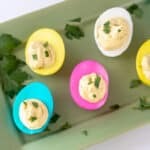 The colour of those eggs is insane, I love deviled eggs but I don’t make them nearly often enough, these sound fantastic! Wow, these eggs look so cute, surely they’ll bring a smile on anyone’s face. Such a fab recipe for EASTER and surely kids would enjoy making it. Yes, the kids have lots of fun! Thanks Jagruti! I don’t think I’ve seen the egg whites dyed like this before, but they definitely look so festive this way! They are fun for a different appetizer! Thanks for stopping by Caroline!